Buff is the most popular of our natural colour finishes. It ranges from a dark orange hue to a chestnut brown appearance and has an elegant timeless appeal. 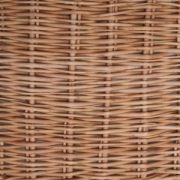 The natural Buff willow finish tends to be the more widely used finish in a typical English basket. The finish comes about as a result of the bark being stripped from the willow after being boiled for over eight hours, leaving the rich dark colour that can be seen. Weatherbeaten Gold is our signature colour finish; it has a light golden weathered look and will suit any basket wanting to create a subtle, yet striking room centrepiece. This finish works particularly well with dark woods as it does not detract from the rich colours of natural, stained and varnished grains. 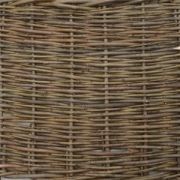 Our Weatherbeaten Gold is the result of storing dried bundles of willow for at least two years in a dark, dry chamber. This allows the tannin in the bark, which would otherwise colour the willow buff, dissipate from the willow and leave it a weathered golden colour. The most rustic of our finishes, the natural brown willow finish is an unrefined brown, green colour. This willow finish has been left un-stripped and has its bark retained bearing all the blemishes of the hard outer skin. 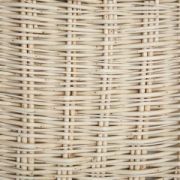 Perfect for outdoor projects and baskets requiring levels of weather resistance, the Brown willow finish is the least self supporting of our finishes and usually requires some Buff or Weatherbeaten Gold willow woven and incorporated into it. Natural White is the brightest of our finishes and has a creamy white hue. Traditionally it was reserved for baby crib baskets, washing and linen baskets. In more recent times it has become a popular finish with interior designers looking for something a bit more special. 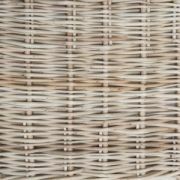 White willow is produced by keeping freshly cut willow alive in pits of shallow water. Here the willow carries on growing for a few months before it is taken and stripped without having to be boiled. Because it is not boiled the tannin is not released from the bark and in turn does not stain the willow a chestnut brown which we would call buff.